In a skillet, heat the olive oil over medium heat. Add the onion and sauté until soft, about 4 minutes. Add the garlic and chilies and cook for a minute further. Add the shrimp and cook until the shrimp are pink on both sides. Add the tomatoes and heat through. Stir in the tomato paste, salt and oregano and cook until the tomatoes break down and the sauce thickens, about 5 minutes. Stir in the fresh parsley and basil and top with the crumbled feta. Place in the middle of a preheated 400°F/200°C oven for 5-10 minutes, or until the cheese is slightly brown and the sauce is bubbling hot. 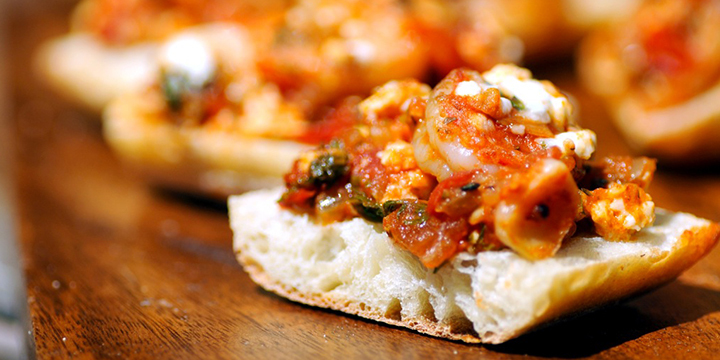 Arrange the shrimp saganaki on baguette slices and serve.